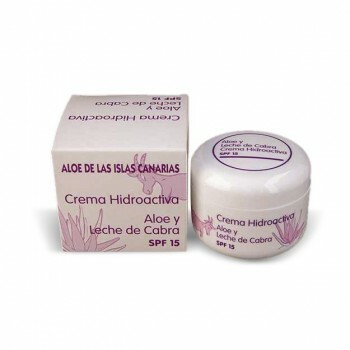 Feel protected and hydrated with this goat milk and aloe vera SPF 15 day cream. Goat milk is rich in minerals, moisturising essential fatty acids, and vitamins, such as selenium and vitamin A, which help maintain a healthy immune system and activate cell renewal. Because of its extra hydrating and non-irritating properties, this day cream is suitable for a range of skin types and conditions, including skin that is sensitive and eczema or psoriasis-prone. With an added SPF 15, this hydro-active day cream also helps to protect from the harmful UV rays of the sun, which can cause skin damage, sunburn and premature aging. Together, these nourishing and soothing natural ingredients are easily absorbed, for skin that glows without being greasy. For all-day protection, apply to the face and neck each morning with small upward, circular motions. Best results can be achieved by combining with the Hemani exfoliating apricot soap.